To consider what the future of HR services will be in SMEs, first let’s look at the current HR practices and approaches being adopted in smaller organizations through a short story. I’ll then go on to envisage the possible growth and how it can generate business opportunity in the future, particularly through the franchise operating model offered by Husys. 1. Currently MSME’s are a huge 51 million size, which is a massive growth from 16 million since 2001. A day in life of CEO @ SME: “Ram an owner of a small business firm with 20 people, had targeted to grow aggressively in future. One morning as he entered his office, he found people lined-up for interview which he finished quickly and post that offered his inputs to the operation manager who had come to seek his support on grooming his team members. As it got close to lunch hours, he called for a meeting with all unit heads who supported him on Operations, Sales & Support. The key discussion was on the new hires and the quality of professionals they needed to compete with the outside competition. They resolved to set clear job roles and approach HR agencies to support them and took help of job portals too. During the second half, he attended a client meet to resolve a pending customer issue in providing timely support resulting in withholding of his due payment. The agenda of the meet was to resolve the issue and improve the delivery standards and finally the customer satisfaction. After his return to office, he gets a notice from statutory authorities on compliance related to Labour laws. An agency was contacted to help him resolve the compliance issue. This story reflects the typical small business owner dealing with People, People & People. As you noticed in the story narrated above, appreciation for Human Resource is very much evident over the last 5-6 years in India. Now with a magnitude of biggest bottom of the pyramid opportunity with SME’s makes a good business sense to build something for these units and make them self-sufficient with people in business. Currently 40+% of the workforce don’t have a proper support of good HR practices. Doesn’t that make a big sense for HR being a biggest business in India? While we do not have exact figures on HR developmental budgets, our estimate of expected spent on HR services by the 51 million SME’s will be a market place for 1.3 billion USD in India (Based on an average spent of 1.2 lacs pa by a SME). How are these opportunities serviced right now? While Husys being the only listed organized player in the SME space in India, there are many individual HR Consultants, Recruiters, Trainers, Payroll Vendors & Payroll IT package vendors operating in this space. There has been a franchise business in recruitment and the collaborative work has been happening in bits and pieces. With revolution in smart phones and access to internet the HR technology business in SME’s is going to be the game changer for future. Who can capture these opportunities? 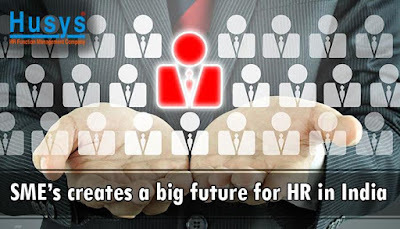 This opportunity of growth in HR can be captured by Non-HR professionals as well as a business proposition. Sales Professionals: Best suited for the recruitment business @ SME. HR Professionals: Best suited for organizational development initiatives, policy, process & cultural building using the above professionals’ expertise. There is a substantial need for integrated approach to support SME’s from HR point of view. Husys provides business opportunity which can help them serve as one-stop-shop service integrator. Husys Franchise model works exactly in that space giving opportunity for Franchise to sell HR Operations, Technology & Consulting. Husys Value Proposition: Husys has deep understanding of HR services coupled with operational excellence in SME’s from last 15 years and has managed more than 600 HR departments.